A flirty birthday greeting was created when I CASEd this card from Wendy Klein, a fellow demonstrator and fellow member of Mary Fish's Stampin' Pretty Pals. I used the Gold and Black & White pieces from the Pop of Pink Specialty Designer Series and added some Flirty Flamingo from the In Color DSP stack instead of using the Melon Mambo colors that Wendy used. Up close you can see the shine that the Specialty paper shows, so I added more shine on the other half of the card by cutting Medium Star Punch Gold Foil. An easily tied piece of Flirty Flamingo Ruched Ribbon is adhered over my Solid Black Baker's Twine. I hate to see this Ruched Ribbon go, but there are plenty of new choices when the Stampin' Up! 2017-2018 Annual Catalog goes live in just about 6 days!! Thank you for visiting today. I hope you will leave me a comment so I know you were here. 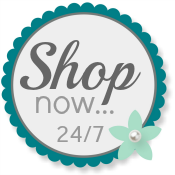 Please use my Online Store for your own Stampin' Up! orders.